According to our tipster, the CBS All Access option wasn't available a couple of days ago, but it now is there. Unfortunately, he doesn't have a subscription so he couldn't test to see if it was live and working well, but the option being there is the first sign of things moving in the right direction. If you have a Google Home, a CBS All Access subscription, and a Chromecast TV or an Android TV device, make sure you go into the Home app on your phone, More settings, and check the Videos and Photos section. If the CBS option shows up, you should be able to link your account and start yelling to see every game and play from your favorite teams. That, as far as I know, is one of the main proofs of true fanaticism. A couple of Google support pages have been updated to add the CW (CWTV) as an option for video and photos services compatible with Google Home. First, CWTV is now in the official list here next to YouTube and Netflix, and second it's also mentioned in the voice commands here. Based on the latter, it appears that CWTV support is quite limited: it will only play the latest aired episode, not the next unplayed one based on your watched history, and it doesn't support next/previous episode commands or turning on/off dubbing. 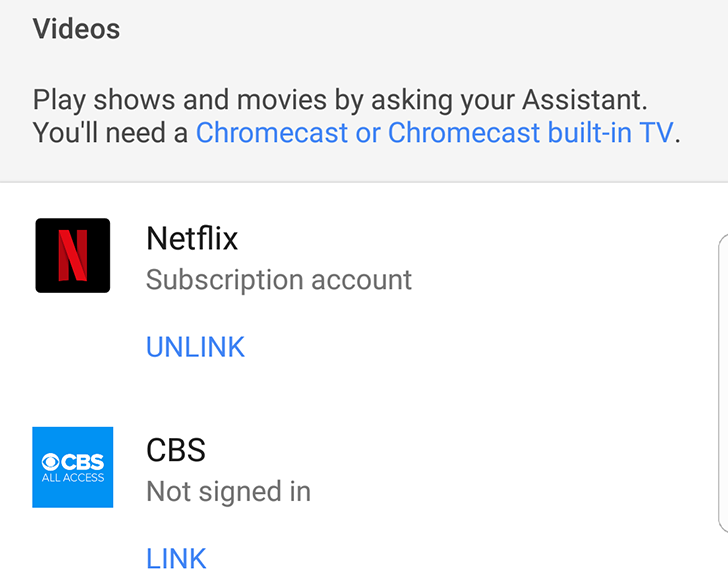 We're not seeing CWTV in our list of Videos and Photos services in the Google Home app, so it either isn't live yet, or more likely, it doesn't require you sign in or link an account. So it might work more like generic YouTube searches and less like Netflix on-demand viewing.